A train that disappears without trace. A haunted chapel containing a dagger with a mind of its own. An entire crime scene which vanishes overnight. A series of unexplained deaths in a museum. A house suddenly abandoned like the Mary Celeste. 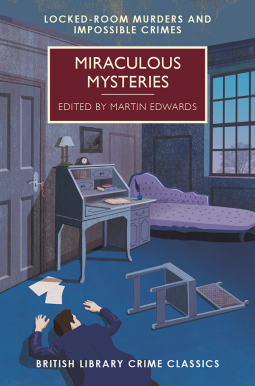 These are just a few of the puzzles to be solved in Miraculous Mysteries, the latest of the British Library Crime Classics anthologies edited by Martin Edwards. There are sixteen stories in the collection and they each deal with a different locked room murder or ‘impossible crime’. These are often my favourite types of mysteries – crimes which at first appear to have no rational explanation but with solutions which are either completely ingenious or so simple the reader is left wondering how they could possibly have been fooled! For that reason, I’m not going to discuss the individual stories in any detail but will just give each one a brief mention. Many of the authors whose stories are featured in Miraculous Mysteries were new to me (although some of them may already be familiar to those of you who have read other books from the Crime Classics series) and I appreciated the biographical information Martin Edwards provides before every story. I was particularly impressed by Christopher St John Sprigg’s Death at 8:30 in which the exact time of a man’s death is predicted, and Nicholas Olde’s The Invisible Weapon, a short but perfectly paced mystery which I felt that I should have been able to solve, but didn’t quite manage it! Although many of the stories in the book feature a crime committed in an actual locked room (Too Clever by Half by husband and wife team G.D.H. and Margaret Cole, Locked In by E. Charles Vivian and The Aluminium Dagger by R. Austin Freeman are three examples), there are others which don’t. Arthur Conan Doyle’s The Lost Special is the disappearing train story I mentioned in my opening paragraph – it’s not a Sherlock Holmes mystery, but it does include a letter written by an anonymous person I would like to think might be Holmes! The Sands of Thyme by Michael Innes – the first time I’ve had the pleasure of reading Innes – is set outside in the open air but the principles are the same as in a locked room mystery, with the crime taking place in a seemingly impossible location. The Music Room by Sapper (better known for his series of Bulldog Drummond crime thrillers) is another good one. By the time I came to this story I was halfway through the book and took a moment to reflect on how rarely, when it comes to stories like these, we are given access to the detective’s own thought processes. The authors included in this collection find a variety of different approaches to take – the detective entertaining a friend with an account of an old case; a passive narrator observing the actions of his detective companion; anything to make the mystery more difficult to solve and to keep ‘obvious’ clues obscured from the reader until the end of the story. What else is there? Well, there’s The Thing Invisible, a gothic, ghostly mystery by William Hope Hodgson, The Diary of Death by Marten Cumberland, about a killer who appears to be using a diary for inspiration, and The Broadcast Murder by Grenville Robbins, which is set in a radio studio. We also meet detectives ranging from the obscure – such as Sax Rohmer’s Moris Klaw, who investigates The Case of the Tragedies in the Greek Room – to the better known, such as G.K. Chesterton’s Father Brown, who appears in The Miracle of Moon Crescent. And it was good to be reacquainted with Gervase Fen, Oxford Professor of English Language and Literature, in Beware of the Trains by Edmund Crispin. I was hoping for something more fun and quirky from Crispin (remembering The Moving Toyshop, which I read last year), but still, this was quite an enjoyable story about a missing train driver. Two of my favourite stories, though, were The Haunted Policeman by Dorothy L. Sayers, a Lord Peter Wimsey story which offers an intriguing twist on the locked room mystery, and The Villa Marie Celeste by Margery Allingham, in which a family disappear from their home – but have they been murdered or is something else going on? This last story is an Albert Campion mystery and I think I actually enjoyed it more than the full-length Campion novel I read last year! Although the quality varied from story to story, none of them disappointed me, and on the whole I thought this book was a great read. I’ll definitely consider reading more of Martin Edwards’ British Library Crime Classics anthologies. I received a review copy from the publisher via NetGalley. I have enjoyed a couple of these collections of older mysteries, too, but this one sounds really good. This one has a good mix of stories by famous and lesser known crime authors. I haven’t read any of the other collections yet, but I think I picked a great one to start with. I read a Christmas one and one where all the mysteries are set in mansions. This is actually the first of the British Library Crime Classics I’ve read, despite seeing so many other bloggers enjoying them over the last few years. At least I have plenty to look forward to now! I am so very tempted by these British Library Crime Classics, as they sound exactly my cup of tea, but sadly I am yet to read one. This is the first of these books that I’ve read, but I’m sure I’ll be reading more. I think short story collections like this are a great way to try out new authors you’ve never read before. I am really excited to read this one – and for a wonder, it is already available in the US (and on my TBR shelves). I’ve enjoyed their story collections, particularly being introduced to so many new-to-me authors. I thought I knew something of the Golden Age writers, but I had only scratched the surface. Yes, most of the stories were very good – and the ones that I didn’t like quite as much still interested me as they were my first introduction to the work of those particular authors. I hope Continental Crimes is another great collection! Well, it sounds like a wonderful collection. Yes, it is! A good mix of authors I already knew and loved – and authors who were completely new to me.